My brother, mother and I set out on the sizzling summer morning of August 9, 1998 for a jog across the Brooklyn Bridge. Mom had always wanted to do that. She was visiting from Maryland that weekend. I remember the date, because we were anxiously awaiting the arrival of my nephew who came into the world later that afternoon. Despite the warm weather, we stopped in at our local gym for a quick sauna afterwards. Then it was back home for a hot shower before heading into the city to show Mom some of the sites. We capped off our sun-soaked march around Manhattan by cooling off in a Greenwich Village movie theater to take in Saving Private Ryan. By the end of the movie my left knee was aching badly. When the lights came back on, I could see my leg was swollen from the knee down into a column shape – couldn’t make out my calf, couldn’t see my ankle. The weather, jog, sauna, hot shower, walking around the city all day in the heat….it was the perfect storm that set in motion the onset of my primary lymphedema. Unbeknownst to me my lymphatic system was not formed right from birth, and my body was like a ticking time bomb waiting for a trigger like the extreme conditions of that day to set it off. Blogging is always better with a friend. My name is Britta Vander Linden and I came down with primary lymphedema on that day 20 years ago when I was 23 years old. Since then, I’ve learned a thing or two about coping with this condition, which has required my attention every day. I started Lymphedema Diary on the 15th anniversary of the onset of my lymphedema. 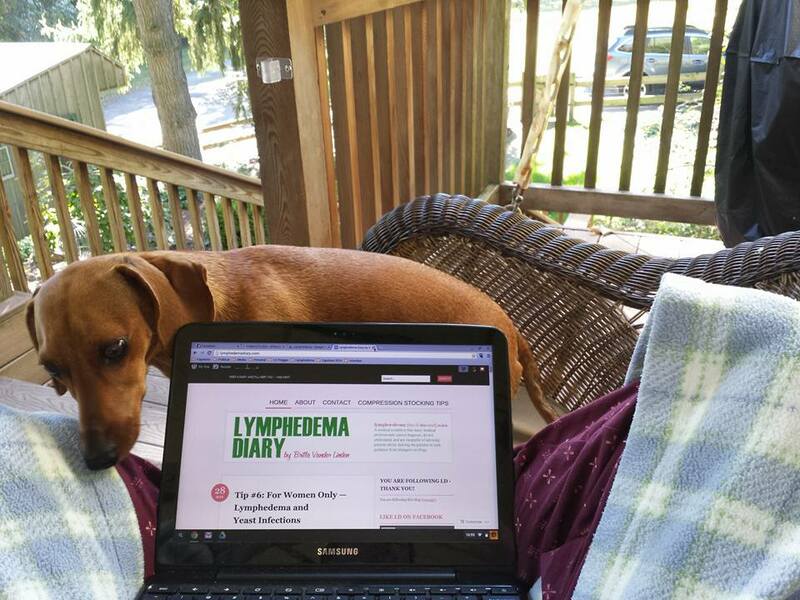 If even one tip or word of advice results in making life a little bit easier for someone else living with lymphedema, then the effort I have put into creating this blog will have been well worth it. I encourage readers not to be shy. Please comment and share your experiences too. As I quickly learned after that fateful summer day in 1998, resources are too few for people like us. We must help each other by sharing our knowledge and experience on this blog, its companion Facebook and Twitter pages – and other forums and websites like it. Nobody – not doctors, not our friends, not our family (as much as they may try) – really understands what it is like to walk a mile in our swollen shoes. Until they find a cure, we are our own best hope. Obligatory disclaimer: I am not a medical professional or authority. The words I write are from my own experiences and knowledge. The advise I provide does not come with a promise of results. Consult a physician or medical professional, before employing any strategies, advice or techniques depicted on this blog.